There is a scene in the movie The Lion, the Witch and the Wardrobe where Edmund and Aslan are speaking to each other. The conversation is private, up on a hillside, with Edmund’s family watching from a distance. Edmund has just returned from the White Witch, and one gets the feeling that Edmund and Aslan are discussing Edmund’s sins. Aslan brings the brother back to his family for a reunion, and he tells the family to not speak of Edmund’s wrongdoing again. I understand the point of the scene is to explain that the sin has been forgiven; let’s move on from it, and I noticed last night, as I watched it, that this action freed the other three children to greet Edmund in love. But it all makes me wonder…. Am I the only one in church today feelin’ so small? The lectionary readings I read this morning were 2 Samuel 12:1-13:, which is about Nathan’s confrontation of David about his sin with Bathsheba and Psalm 51, which is David’s confession psalm after this incident. The author of the devotion speaks of how confession can be freeing. How does showing our weaknesses build up the body of Christ? When we were at SpiritSong, the lead “guy” for Casting Crowns spoke of how he has attention deficit disorder (Please listen carefully – I am in no way equating ADD with sin – I mention this because Mark Hall was speaking about it how it has been a challenge for him). I was so impressed that he would share this part of himself with the audience. How many kids sitting there had ADD or knew someone who did? How many now look at what God has accomplished through Mark Hall, and realize that God can remove any stumbling block from the paths He wishes them to take? How much more so with sin? I’m not advocating that we all stand up on Sunday morning and confess our sins to the congregation. It would take way too long, and you know we need to be at lunch at noon. I do think, though, that by never talking about our shortcomings, we leave the impression that we don’t have any – we leave that impression with ourselves. Not talking about what we do wrong; not taking time to apologize, can leave us judgmental and “plastic.” Hard and shiny, but ready to crack under pressure. I’m not sure that Aslan’s “Let’s not speak of it again” philosophy is always the best policy – I’m sure sometimes it is, but is it always? We went to Faith UMC last night for the pre-opening (I don’t know what to call it) of VBS. The VBS theme is The Lion, the Witch and the Wardrobe, so we watched the movie together (in their Sanctuary; on their projection system, she whispers snidely (I want one in ours)). If you’ve read the movie or seen the book (are you paying attention?) then you know that there is a scene where the White Witch kills Aslan in payment for Edmund’s sin. Last night, at the point right before this – when they’re shaving Aslan, and being generally horrible to him, the projection system lost sound – silent torture. To try to fix the problem, they paused the movie. They paused the movie at the exact moment when Jadis kills Aslan, and the paused scene on the screen was the very moment when life fades from the lion’s face. His death – frozen in time, and huge on the screen in front of us (for a long two or three minutes). I wonder if we sometimes leave Christ’s death like that. We fail to push the play button, and we fail to carry the gospel all the way to the resurrection. I know some would argue that the moment in time frozen on the screen last night is the very one that saves me from my sins. It’s the resurrection, though, that brings it all alive. We need to live as resurrection people, free from sin, and able to realize that our sins and weaknesses can be used by God for his own purposes. We need to live free from the fruit of self-righteousness – judgment. It’s hard. It’s a challenge to step beyond the sin to the forgiveness and mercy that is offered. But I think that it may be essential. BTW: It was worth the price of admission to watch Pam G jump out of her skin when Edmund first meets the nasty wolf among all of Jadis' lawn art. It's a good thing the pews at Faith are screwed to the floor, or she might have lifted one off the ground. And on the wings of the flies. His eyes squinted against the sun. "He wants us to feed all of these people." They looked out over the crowd. Hungry for the Bread of life. And said, almost to himself. We do not have enough." Feeling the weight of scarcity. Came to him, and tugged on his robe. He held up his basket, grungy and dirty. He said, "I have this. You can have it all." But his smile was complete. And for his generous spirit. Andrew picked up the basket. Although he felt like a fool. He carried the basket to where Jesus sat. "A boy gave me this. I know it's not nearly enough." And told him to have everyone sit down. They all were part of a miracle. Jesus had one more transformation to perform. So that they could be changed. Could be enlarged by witnessing abundance. What had been small, had been changed to excess. Had born the fruit of a miracle. Jesus had shown them more than enough. It had been a day of many miracles. Thanks to Jeff's comment and sermon today for many of the images. Image: Sunset across the street from our house. Last Sunday I made of list of spiritual gifts. It was part of my notes for the class I taught. I was having trouble articulating the difference between a talent and a spiritual gift, so I thought if I made a list of the spiritual gifts mentioned by Paul in his letters, I could use examples to help me express my point. I'm not sure I ever made the particular point I was striving to express in class, but I did find that the list was interesting (to me). I have to confess that I love to organize. I tell you truly that you wouldn't know that if you looked at our house, but outside the house, I really like it. I walked away from a recent VBS meeting (this week) with questions about organization. Where is the line between organization and rigidity? And if we consider that organization can be a gift from the spirit, then how is it used to "build up the body of Christ?" And can it be an impediment? I was walking down the hallway with two of the VBS coordinators from other churches. One of them has impressed the socks off of me with her organizational skills (we'll call her "O"). The other one (while she is very nice, and has wonderful ideas) reminds me of our previous DCE (which actually might explain some of my responses to her -- I'm having flashbacks -- we'll call her "N"). Please understand that they are BOTH wonderful people. Me: (something like this) -- OK, this is great. I'm feeling it coming together (and we all know that it's alll about making Kim feel better). N: So you're not one of those "fly by the seat of your pants" people? Me: (laughing hysterically inside, but trying to be calm) -- Uh, no. O: Me neither. I need to have a plan. I pushed pretty hard at that meeting to have some decisions made (not the outcome of the decisions -- just, please please please make some). I pushed harder than I usually do, and went home feeling that the "loving" part of spiritual gifts had perhaps been abandoned by me. If I'm honest, detail oriented people -- list makers -- can sometimes miss the big picture. We can miss the point of the project all together in the effort to make sure that we have enough chairs and there are signs telling people where to go. In the frenzy of making sure that each brush stroke is "correct," we can end up with a "paint by numbers" portrait when we're done, with no room for inspiration or art. I'm not saying that that is what I do all the time, but it is something that I have to be careful of. That said, there are times when organization is what teaches us the steps of the dance. If we can use pre-planning to move obstacles out of the way, then we start the evening with an empty dance floor. We know the steps, and we can keep our eye on the One who is leading. The dance becomes about getting closer to God, rather than about the distractions. There are moments (and they don't happen very often) when I know that God has done something through one of my lists that has cleared the dance floor for someone else, and I love those moments. I think this VBS is going to work out. I think that it may be successful because of all the many people who have worked on it -- each bringing his or her own gifts to the party. It will be more than any of us could have done on our own, and God is going to take the many offerings and transform them into what He wants them to be -- whether or not we have enough chairs. My graduate work, many years ago, was with a little bug called Ameletus tarteri (First, don't click that link. It's a pdf file of our publication, and the only link I could find to my bug -- but it's big, and ugly, and not very exciting. Plus, yes, I know, mayflies aren't TRUE bugs, but you and I know what bugs are, and it is a bug). I spent two years learning everything I could about its life habits. Where it lived, how it survived the winter in a creek whose temperature – while running – measured freezing on a thermometer, and how it was adapted to live in an acidic environment. I chased it in the dark, I brought many of them home in the car with me – alive in the trunk, and I tried to tempt it to emerge into its adult form. I counted them, I measured them, and I weighed them. Like a forensic scientist, I examined their stomach contents to see what they liked to eat. Aren’t you glad you stopped by today? In short, I spent a lot of time learning about a tiny little creature. We spend our lifetime trying to learn about God. It’s not nearly as easy as chasing a mayfly around for 12 months. Meet Marvin. Marvin (short for marvelous) is a dragonfly. For the past couple of days, Marvin has been flirting with me. When I get to work, he divebombs my car. I get out, bringing my camera, and begin the hunt for a photograph of Marvin. He never sits still, but he keeps coming back. Zip Zip – all around me, pretending that he is going to park for a moment on the car hood or on a nearby plant, but he never does. I can’t see many of his details, but I know that he is beautiful. Sometimes God is like that. We just can’t get a “handle” on him, or get him to stand still long enough for a really good photograph. It’s frustrating, especially since we know how wonderful it would be to get a little bit closer, and to see a little bit more clearly. That’s my only photo of Marvin. Terrible, but it’s proof that he does flirt with me. After I took that picture, I walked into the building, and saw this moth. She was perched on the brick of the building, and never moved. Sometimes, for a few moments, God is like that. He stands still, and reveals Himself to us. We get just a moment, just a short time to stand and gasp. If you think about it, Jesus was our greatest opportunity to know God. Jesus was God revealing himself, as best as we can understand Him, for just a moment in time – for all time. Images: The first one is not MY bug, but it is an Ameletus, and it looks like MY bug. The other two photos were taken yesterday -- Marvin and the Moth. Just know for scale, that those are "brick-sized" bricks. 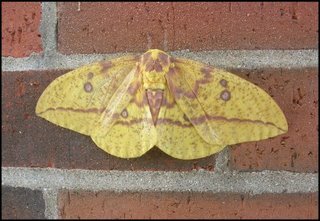 The moth is one large moth. Data, data and more data. And that's only part of it. Much more is stored in other places. 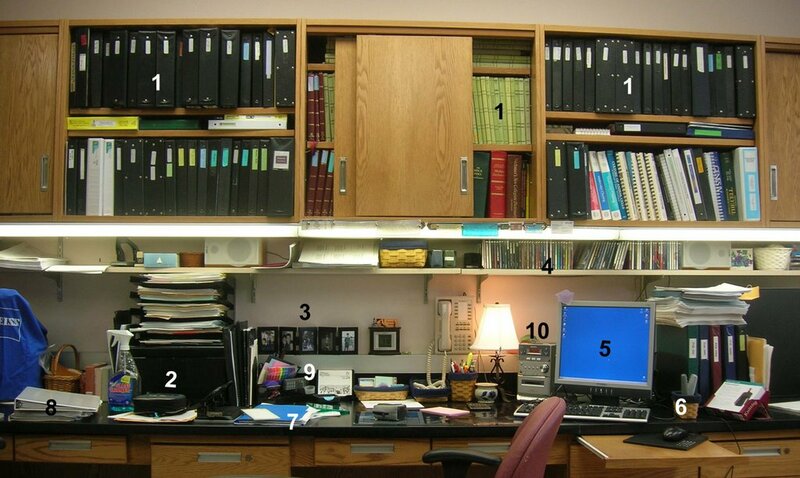 Also on these shelves are books of procedures and regulatory manuals. Fun reading. This is a box over a natural gas jet and vacuum regulator. Don't you have one of those on your desk? I keep I box over it so I don't kill myself by mistake. These are pictures of my guys. My CD shelf, ranging from The Beatles to Third Day to Matt Redman to instrumental soundtracks. Variation. Computer. If you lifted its skirt, you would see that it has no A: drive, no CD drive, and no working USB port. Do NOT load any files onto this computer. They like a "closed system" here. My basket of remotes -- one for the little shelf unit on my desk, and one for a CD player across the room that I use for my satellite radio. I use the remotes for quick silencing when I'm working, and someone comes into the room. Blue folder for purchase orders. It is sitting on top of a Copyright release form for our newest publication. VBS notebook (that would be vacation Bible school, not some weird scientific thing). Just so you'll know this is MY desk, those are highlighters -- all colors -- just cause I like them. Hiding behind my CD/stereo is a porcelain carrot. We do vitamin A research -- you should eat your carrots -- they're good for you. Just so you'll know, after I took the picture, I had to go clean off my desk. I couldn't stand it. You would think that I am one person at work (who likes a clean desk) and another person at home (who can't find her desk under all the -- um -- stuff). Does your desk tell anybody anything about you? What is your prayer for your church? If you, like Paul, were to sit down and write a letter to your church, explaining to its members your thoughts and dreams, and if you felt compelled at the end of that letter to write a prayer for your church, what would that prayer be? I was reading Ephesians 3:14-22 this week, and I think I might want to steal Paul's prayer. I'm going to break it into pieces for this post, but the whole prayer in its entirety is quite beautiful, if you have time to read it. Verses 14-17: For this reason I kneel before the Father, from whom his whole family in heaven and on earth derives its name. I pray that out of his glorious riches he may strengthen you with power through his Spirit in your inner being, so that Christ may dwell in your hearts through faith. Doesn't it sound to you like Paul is praying that the people at Ephesus will be made so strong in their faith that they will be able to touch their hearts and say, "I know. I am convinced that Christ dwells in me."? I want that for my church. I want the members to walk out of the building convinced that God was in church with them that day, and that they leave the fellowship to enter their week with the sure knowledge that God walks with them. I want that for them; I want that for me. Verses 17-19: And I pray that you, being rooted and established in love, may have power, together with all the saints, to grasp how wide and long and high and deep is the love of Christ, and to know this love that surpasses knowledge -- that you may be filled to the measure of all the fullness of God. There's an old cliche that when Christ was asked how much he loved the world, he spread out his hands, and said, "This much." I would also pray that we would all know -- that we would grasp -- just how wide and long and high and deep is the love of Christ. I love that sentence, and I'm disappointed that I've never noticed it before. I just think that if we could "grasp" the hugeness of the love of God, then we would all be transformed, and so would the church. Verses 20-21: Now to him who is able to do immeasurably more than all we ask or imagine, according to his power that is at work within us, to him be glory in the church and in Christ Jesus throughout all generations, for ever and ever! Amen. To him who is able to do immeasurably more than all we ask or imagine.... Wow. I read today the story of the feeding of the 5000 and of Jesus walking on the water in John (John 6:1-21). In my tired brain, these two stories rammed into the prayer in Ephesians. I was struck by Andrew in the story, and how he stands in front on Jesus with a basket holding 5 SMALL loves and 2 SMALL fish -- convinced that this cannot possibly be enough. How often do I stand in church (metaphorically) holding a basket of small fish and small loaves, and say to myself, "This will never work. This is not possibly enough." I've said it somewhere before (and I got it from S), it is a failure of imagination. If we are doing the will of God, then we ought to know -- to realize -- that what we will always have "enough" to get the job done. I pray that I would realize, that we would realize, that He can do more than we can imagine -- and that our blessings and gifts are sufficient -- abundant -- overflowing for the tasks He has assigned us. Jesus walked on water in the passage from John, and the disciples were surprised. Stunned. But then they believed. I'm all for surprises, but I pray that after God surprises us, we, as a church, we be able to say, "Wow! That was great! What's next?" instead of saying, "Jesus, you're dripping water in our boat." May we KNOW the certain-ness of His presence, the infinite nature of His love and the abundance of His ability. Amen. Falling from heaven like dew. Exhortation: language intended to incite or encourage. (Sidenote – the dictionary gave the Latin word hortari as part of the entomology of the English word “exhort.” Hortari means to incite, urge or encourage. Hortari is also part of the entomology of the world “yearn.” Isn’t that interesting? No? I think so. As part of the Body of Christ, we are to watch for God’s gifts in other people, and then to point them out. Why is that? What purpose does it serve for me to tell you what you may already know? In fact, Scott (in class) warned that this could lead to pride in our accomplishments rather than recognition of gifts. While I admit that this could be a danger, I think the bigger danger lies in NOT doing it. We encourage our children all the time. We see what they are doing well, and we point it out to them. Exhortation helps us to recognize gifts that God has given to us when we might ignore them. It gives us confidence to step onto shaky ground. It encourages us to witness to others about their gifts. And maybe, if we’re doing it right, it points to other people the presence of God in their lives. If we are saying that we recognize a gift from God in another person, we are, logically, telling that person that God is working in his/her life. I read the devotion this morning in Disciplines. It was based on Psalm 14:1-3. I mentioned that psalm yesterday; it is one of the more depressing ones, and I’m glad MY job wasn’t to write a devotion centered around it. The author brought up a point, though, that I really liked, and that, in my mind, parallels exhortation. To me it is further evidence, if we needed it, that this thing called “church” is necessary. I have no doubt that if you are sitting in a room by yourself watching a church service on TV, that God can be with you. Certainly He can be there, but I can’t. Alone in a room, you are missing the ways in which the Body of Christ can (and should) point to God and say, “Look! Have faith. He’s here – He’s active in your life, and you matter to Him.” I think we need that, because this “faith thing” is too hard to do solo – maybe because it was designed to be a team endeavor. Images: Reflections of light. Are we called to mirror God to people? 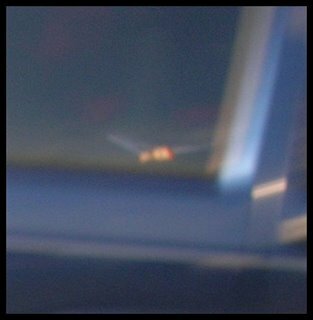 The first one is of the sun reflecting in the window of the Outback. The second is Dave's porch light reflecting in the rain. The last one is the sun reflecting in the rearview mirror of the van on the way back from KI. I love the text, "Objects in mirror may be closer than they appear." If we do our job, then the people around us will realize that God is closer than He appears. It made me wonder if he has read the entire book or not. Yes, there are some gorgeous, inspiring, wonderful Psalms, but then there are some that are – not. I’ve mentioned before that I’m reading Yancy’s book, The Bible Jesus Read. One of the chapters is about the book of Psalms, and it has started me thinking. So what does the book of Psalms say to us? I ask this question not in reference to a particular Psalm, but as a question about the entire book as a whole. I think we are reminded that God can take it. These are prayers, sent from God’s people to God himself, and we are just reading them as a spectator. From the time of Abraham, when he argued with God about Sodom and Gomorrah, through Moses, who expressed his doubts that he could possibly be the one to lead God’s people out of Egypt, through David (to whom many of the Psalms are attributed) and even up to Doubting Thomas, God has allowed – maybe he expects – His children to have problems. He’s OK when we tell him we disagree, or that we are angry, lost, hurt, doubting, or abandoned. I still like the thought that the one request that God granted Job was an audience. We can share all of this with God. Not only is He OK with it; He wants us to do it. Also in Yancy’s words, “The language of lament is oddly the shadow side of faith.” We cry out to those who we deeply, wildly trust. God wants that trust, so he willingly accepts the lament. Looking at the entire book, one can see that the emotions of the Psalms are not consistent. The tone of each changes, from one to the next. I think this can serve to remind us that our lives – our faith journeys – are not flat. Not only that, but our faith journeys are not a set of stairs straight up to God. It doesn’t work that way. Our faith journeys are more like a roller coaster – up and down, twisting this way and that. One day we may feel close to God, the next day – not so much. The general direction is toward God, but sometimes in the day to day, that is not so apparent. When we took the youth to SpiritSong, the adult chaperones had an ongoing joke (several, actually, but this one comes to mind). Standing, looking a roller coaster, someone would wonder out loud how likely it was that the car would jump the track. “That hardly ever happens,” was always the answer. Our faith journey is a little bit different than that. We’re stuck on this ride with God-epoxy – He’s got us, and he’s not going to let the ride jump the track. We can be assured on the downhill portions, during the times when the car goes upside down, and twists around like a corkscrew, that it’s OK. It’s just part of the journey, and even when we can’t feel our faith, God still has a hold of us. I also think that having all of these very differing kinds of prayers in a seeming random order in the book of Psalms can point out to us that while we may all be on faith journeys, those roller coasters aren’t synchronized. While we may be riding high on a Psalm 8 awareness of the wonder of God, someone else may be wondering “My God, my God, why have you forsaken me?” (22:1). We have opportunities to help each other through times likes those, if we can remember to do it. Image: Yes, you've seen it before (back on July 8), but it seems appropriate here, too, so here is is again. 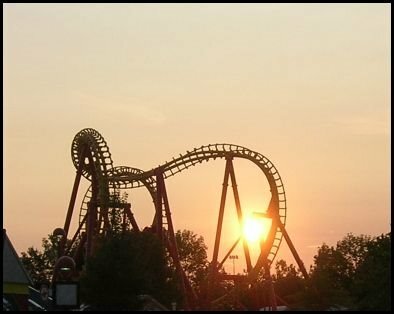 This is Face Off (a roller coaster at Kings Island) and the sun. The answer, of course, was that it could become anything (as long as it was blue). Unlimited potential. Do we ever have enough faith to believe that? This morning I was watching the Today program. They did a segment about the new winner of the Tour de France, Floyd Landis. In 2003, Landis suffered a training accident which injured his hip and the top of his femur. He had two operations to correct the problem, but the top of his right femur would not heal. He developed avascular necrosis, which is bone death caused by a lack of blood flow. It has made the bone in this area comparable to rotting wood. He has a limp (which he has hidden) and can’t run. It is painful to climb stairs. In fact, 25 – 50% of the bone in this joint has collapsed. Landis’ orthopedic surgeon said that “he would have bet his house” that Landis could not be competitive in the Tour de France. On July 19, he had the “worst ride of his life,” leaving him 8 minutes behind the leader. I don’t know much about sports, but 8 minutes sounds like a REALLY long time. So consider where he stood. Eight minutes behind, with a disease that was degrading his hip joint. What potential could we see in that? He went on the next day to have what the French newspaper L’Equipe called “the ride of the century,” and he won the Tour de France. Wow. We’re pretty quick to say that this is a story of human determination – that even with horrible odds, in a situation which doesn’t seem to provide much hope for victory at all, triumph was snatched from defeat. What we would see as hopeless, Landis was able to see as potential. And we would be right. That the young boy in vacation Bible school who won’t sit still, who talks all the time, and who is Frustration with a capital F, still might be feeling the touch of God through us, even if we can’t see it? That the man addicted to drugs might finally see the light, and grab hold of his life, before it is completely gone? That even the hardest heart in a church can be touched by grace, and we will have the joy of seeing the change? That God can take a church whose service to the poor was mainly through a few individuals and some monetary contributions, and create a church that welcomes homeless for a meal each week – that incorporates them into the Body as indispensable members? (Oh, wait, I’ve already seen most of that happen). Potential. Endless possibilities for an unformed piece of square blue clay. Do we have enough faith to believe? Do we believe in God enough to understand that even what seems impossible to us, is only potential to God? But instead with fear and selfishness. There are walls in our church. They keep out the light. Is God's breath, blowing through the rooms. Than even though ones that hold up the roof. When God's breath is felt. And the graffiti on them is telling. I don't like the youth to play loud music. You're sitting in my pew. Stop clapping; it isn't right. and that makes you wrong. Your ideas are too old. Your ideas are to new. They are mortared together with shoulds and oughts. They stand on a shaky foundation. And yet they still stand. They wall us in; away from each other. If there is a wall between us? Then we need to start demolition. Blowing freely through our church. Sorry ahead of time -- this one is really rambly (is that a word?) and probably doesn' t make much sense, but I'm going to leave it that way. Of the door called change. Are all as they should be. Ideas that gave birth to crystal. Lumpy mounds of odd clay. I know the path through the room. And the walls are painted with my identity. The joys of the room. For it is impossible to carry it through the door. And needs to be left for the next tenant. Filled with haze and uncertainty. And the limits are not known. Be helpful in the new room? Or would I trip and fall? To figure out the steps? As well as the previous tenants? But two rooms make echoes. And how much has to stay behind. Trying to listen for God. Or should I be standing somewhere else? In the doorway with me? Image: Remember this photo? From this post? I was at Starbucks this morning prior to my reunion group meeting, and took another picture. Two rooms. Someone found this blog, this post in particular, by searching Google with the keywords "sleepover seven boys." For whatever unknown reason, this blog came up as the seventh "hit" out of 335,000 total hits. Apparently, some mom or dad has his or her hands full, and is desperate for some ideas. I think they may be in trouble. Seven boys in one sleepover. My idea is to not do it. When I was deciding last year whether to continue in the volunteer position that I hold at church for another year, one of my biggest fears in keeping it was Vacation Bible School. We would be heading into a year with no Director of Christian Education, the last VBS I had even attended was when G was two, (where my job had been to help in the nursery -- a whole other story for a blog post one day), I had never been on the organizing side of a project such as this, and it certainly sounded like a whole bunch of volunteer recruitment to me (Remember me? I'm the one who hates to ask people to do things). I would like to say that I stayed in the position and told God, "Well, God, I don't know how to do this. You'll have to help me with it," but that's not what happened. What I did was to tell Joe (our pastor) that I would keep the job I had, but that someone else would have to be found to do VBS, because I couldn't do that." The time came to start making plans for VBS and an opportunity arose to combine forces with a few other churches in our area, which we decided to do. "Someone else will have to be found to do VBS" became "Kim will need to find someone do VBS" (Notice the oh-so-subtle difference which really means that Kim will have to ask someone to do something?) My idea was to find a triad of coordinators -- three experienced volunteers who would be able to share the responsibility and burdens of moving this project from thought to actuality. Two people I asked said yes, one said no, and one never gave me a response. Close enough. Our church accepted the task of dreaming up and implementing the craft protion of VBS. Keep in mind that this VBS is not pre-packaged -- it's a custom effort, so the crafts had to be selected and designed by what my mother would call "the seat of their pants." I helped our duo put together a crafty committee, and then I went on vacation. My intention was to jump into the craft effort when I got back, but other things conspired against that. Other than a few tidbits here and there about progress, that was the last I heard about what was going on. I worked promoting the VBS in our church, and maintaining a web page for the event, but had no hand in the crafts. This week has been two teacher training meetings. On the first night, I got to see what wonders this duo of power and their committee has done. Eight crafts, all prepared, all organized, all supplies ready and sheets of instructions printed out. The biggest joy was to watch this duo in action. One of them is one of the most talented teacher of children I know (and also one of the most self-deprecating). The other is AC Moore in a red-headed package. Their sense of humor is as dry as the Sahara, but they worked as one unit, and I just sat there in amazement and laughed myself silly. There is a huge WOW factor in going from "we need crafts" to seeing them all sitting on the table before you. Last night the rest of our volunteers came in for training. Why am I always amazed that people say "yes?" That they take their time, show up, learn how to assemble a snow globe from a baby food jar and glitter, and then tell me that they'll be back every night of VBS to be volunteers? Maybe, now that I think about it, it's amazement, but it's also joy -- I'll take joy and amazement any day. I do have worries about this whole enterprise (not about the crafts, but other parts). I was sitting at the computer yesterday evening before the training, talking to S, about to launch into a whining litany of my worries about VBS -- small space, curriculum (do we have one? ), fluid decision making skills, parking, etc etc etc. I started my rant with the sentence, "The purpose of this week is to teach children about God; to bring children closer to God..." Before I could start ranting, S said, "And that's why I don't worry about it." What a way to stop me in my tracks. It occurs to me this morning, in a kind of shell-shocked way, that, even though I didn't say, "God, you'll have to take care of this," that that is what He has done. He found the perfect pair of people to do the work, He has convinced wonderful people to give of their time to make it all happen, and maybe He has kept me out of it, so that now I can look back now and see His handiwork. Trust God -- that's my lesson in all of this. I lift my eyes unto to the hills; where does my help come from? I guess if He can handle heaven and earth, He can handle vacation Bible school. Images: Fog and sun on the hill at work. What you can't see are the people in cars behind me wondering what the heck I'm doing. I have a bad habit of reading a blog or an article, seeing something that interests me, thinking that I should incorporate it into a post, and then convincing myself that I’ll be able to remember where I read this really relevant tidbit and to return to it when necessary. That doesn’t work. I can never find it again. That is the case today. The main idea in this post is from someone else’s blog, but I can’t remember where I read it at all. I thought I knew – I thought it came from the blog 42 by Dave Warnock, but I can’t find it now. So just be aware as you read this that it is based on my memory of what I read, and that I can’t confirm it or share with you the original link. It is a little ironic that the name of what I thought was the originating blog is my age. Maybe there is a clue in that. If you have read this blog before, or if you know me, then you are more than likely aware of my viewpoint regarding the role of women in church – it is whatever God tells us it is. I’m aware of the writings of Paul on the matter, and I have read many arguments on both sides of the women in ministry issue. To me, it all boils down to what God is calling us to do. I believe that God does call us to particular types of ministry (ordained or not), and that He graces us with the spiritual gifts to accomplish the calling. I am called to be a teacher in the church. To borrow a phrase from someone I know, “It’s something that I can’t not do.” That’s not a statement of my abilities; it’s a statement of God’s work in my life. In the same way, I believe that the women of my acquaintance who are ordained ministers in the church have a calling to that profession. I believe they have the same “I can’t not do it” feeling about their calling as I do about teaching. That said, I also believe that God would not call anyone to do something that was against His will; that would be illogical and painful for the one being called. It isn’t logical. A member is a member, and one member should not outrank or outweigh another in the church. It isn’t the way we do things. That said, the blog post went on to explain that some found this viewpoint to be a slippery slope. If we say this is true for the ordination of women, then we will eventually be led into saying the same thing for homosexuals. This opened my eyes to an issue I had been avoiding. I have always believed – from the first moment that I realized that it was an issue at all – that everyone is entitled to the grace of membership in a church – and that homosexuality shouldn’t be – can’t be – a stumbling block in the way of that inclusion. I have avoided really thinking about the ordination of homosexual church members. It hasn’t been an issue that I have had to confront in my life. I know that it is – and probably will continue to be – a tinderbox in the Methodist church. So, when the article called this kind of thinking a “slippery slope,” I now have to agree. I’ve slid off the fence of avoidance, and now stand here – feet planted firmly on the idea that all members of the body of the church are equal. If I say that women are entitled to ordination because it is one of the possibilities of full membership, then I must also say that the same is true for our homosexual members. I don’t think that this is an issue on which I’ve changed my mind, it’s just an issue that I have finally been able to clarify in my mind. I don’t know what this will mean to the future of the Methodist church. I pray that it is something we will be able to resolve through the love of God. I'm teaching this Sunday using the 1 Corinthians 12 passage about the body of Christ. I haven't yet read the lesson (it's only Wednesday), but I've been thinking a little bit about it. I've also been thinking about the walls we build in the church, and how that relates to the body of Christ. Have you ever had one of those experiences where you've got something on your mind, and the universe (or the Lord of the universe) keeps throwing things at you, "Look at this! Look at this!" I read a passage from Epheisans (2:11-22) this morning with my mouth hanging open (not literally, just figuratively). I read it from The Message, which, for me, can sometimes bring "the message" into sharp relief because of its modern language. I've linked the passage above to The Message version, so if you have time, go read it. The Messiah has made things up between us so that we're now together on this, both non-Jewish outsiders and Jewish insiders. He tore down the wall we used to keep each other at a distance. He repealed the law code that had become so clogged with fine print and footnotes that it hindered more than it helped. Then he started over. Instead of continuing with two groups of people separated by centuries of animosity and suspicion, he created a new kind of human being, a fresh start for everybody. And then I drove by church this morning and saw the title of this Sunday's sermon which is "The Dividing Wall." Now I know that it probably isn't a coincidence; our church follows the lectionary readings, but it did stop me. I had a topic in mind to write about this morning, and what is written above is actually the introduction to it, but as I sit here, I think that my topic is changing. I liked the one for today, and it does apply to the Ephesians passage, but I think I'll save it for another day. And I'll keep my hand steadily on him, yes, I'll stick with him through thick and thin. Do you think I'd withdraw my holy promise? or take back words I'd already spoken? I've given my word, my whole and holy word; do you think I would lie to David? Note: I just did a bad thing -- I lifted verses up from a passage of scripture without giving you context, so don't trust me -- go read the whole thing if you want to know where they fit in. I just chose verses I liked. How do we get from where we are to that place where David is standing? It isn't by being perfect; David certainly wasn't perfect. That's plain enough, isn't it? You're no longer wandering exiles. This kingdom of faith is now your home country. You're no longer strangers or outsiders. You belong here, with as much right to the name Christian as anyone. God is building a home. He's using us all -- irrespective of how we got here -- in what he is building. He used the apostles and prophets for the foundation. Now he's using you, fitting you in brick by brick, stone by stone, with Christ Jesus as the cornerstone that holds all the parts together. We see it taking shape day after day -- a holy temple built by God, all of us built into it, a temple in which God is quite at home. I know that this is a passage in which Paul is trying to convince the Ephesians that there is neither Gentile nor Jew anymore -- the walls are gone, removed by Christ. Even knowing that, when I read it with my eyes, I see the assurance that God has taken down ALL the walls. He's building a place for us -- a place where we belong. He's using us, brick by brick, to build a dwelling place for us, and, amazingly, for Himself. What's stopping Him? We are. We build our walls. Those walls separate us from each other, and they separate us from God. We try to build our own dwelling place, using our own blueprint, on shaking ground. The walls we build are mortared with a lack of trust in God. The bricks are our lack of faith, our fear, our tight grip on control. The whole time God is standing in front of us, pointing to his temple, and saying, "Look. I'm building this for you. Come out, and be a part of this!" We shake our heads, not looking up, and continue to build our walls. Until we are walled in -- all alone. God stands outside, still calling, and we keep piling pebbles upon sand. Sometimes, though, we peak a head out of a crack in our wall, and see God standing there. He's looking right at us, coaxing, as one would to a hidden child. Maybe, just maybe, we take a step out. We get splashed by God's waterfall, and wonder why we're building all these walls. Images: The first one is of the marquee at our church. Imagine me stopped at the light, taking a photo from the car. Probably not a very bright move. The second one is of our backyard this morning -- a doe and two fawns. Can you see the second one? He's coming around the tree. I wish the picture was a video, because those fawns were having fun this morning. Fawn Fun. Today is our 19th wedding anniversary. To mark the occasion, I thought I would post some memories of life 19 years ago (and a few that are a little older). Our first date was December 29, 1984. We both worked at the mall -- S at a one-hour photo development store, and me at a bookstore. Prior to our date, we had only talked on the phone (for a very few minutes). He came by the house at 10pm that night to pick me up (after work), and we went to Shoneys for dessert. We sat and talked for hours -- I think we may have closed the restaurant (they were open late back then). Either that night, or right before a date very soon after that, my mom, who didn't know S (neither of us did, really), handed me a quarter as we were leaving the house: "In case you need to call your mother." Remember that story; it will come up again. He proposed one year later on December 29, 1986 in the rose garden of Ritter Park. He started out with the phrase, "Everybody has dreams..."
On the day of the wedding, Mom, Judy (S's mother) and I spent a couple of hours at the house together, getting ready and talking. It was a wonderful "girl time." We had so much fun that we were almost late getting to the church. Judy and Mom drove down together, while Dad and I drove down together. As we were leaving the house, I noticed that's Mom's dress was caught in the car door. No one had ever heard of cell phones, so we spent the trip to the church chasing her, honking. Luckily, there was no mark on the dress when we got there. I don't know what she would have done if there had been. Steve's aunt, who was the Mistress of Ceremonies, was a couple of hours late. She has very white hair and had done something that morning to turn it purple. She spent a lot of time that morning frantically washing it, trying to un-purple it. No cell phones; we had no idea where she was. The carpet in the church at the time was kelly green. 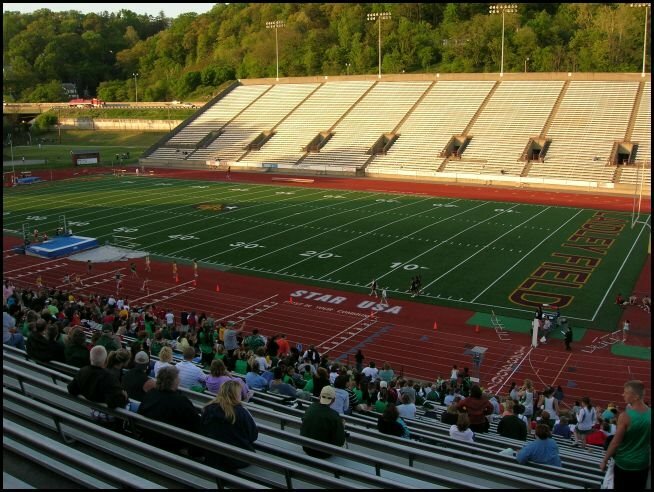 Until this morning, the thought never crossed my mind that it was the color of astroturf. S escorted his grandmother down the aisle to her seat. One of the most memorable moments of my life was standing in front of this man as he promised to spend his life with me. Until that very moment, I had not realized how incredible that would feel. Unbelievable. When the ceremony was over, the wedding party recessed to the back of the church and then up the stairs to the balcony to wait until everyone had left the sanctuary so that we could go back in for pictures. At the top of the stairs, S turned around and handed me a quarter (remember that quarter?). I don't remember exactly what he said, but the handing back of the quarter meant that we all knew him well enough now that I didn't need the extra insurance. We drove to Wytheville, VA that evening. Other than breakfast, the only thing I ate that day was a pack of crackers from a rest stop vending machine. My aunt and uncle owned a house on a golf course on Seabrook Island, South Carolina. We spent a week there for our honeymoon. It is an enormous, indescribable blessing in life to be married to your best friend. It has made my life full of joy and laughter and love. Happy Anniversary -- I love you! S handed me a piece of paper today. It was a prayer that he had written for a friend he knows through work. That gentleman has had back pain and surgery, much like S. I thought what he wrote was wonderful -- grace-filled -- God-inspired. Being who I am, I asked him if I could post it. He said yes. And yes, a friend -- a confidant, a sounding board. His family understanding, his loyal team ever ready to take up his litter and march on. A prayer goes up; grant confidence and competence and unerring skill to the surgical staff; grant comfort and strength to the patient and his family. There is much to be done. A wife to love, a daughter to guide, basketball games to win. And who knows, maybe even a Hula Hoop to best. The seasoned tell the novice "Take heart, everyday will be better"
My prayer is for healing and returing to life. Yesterday was today, then. Tomorrow will be today when it comes. Today I said a prayer for a friend. What's in a small group? What is the purpose of a small group in a church? Wesley liked them; insisted on them. The church development process we are involved with in our local church ranks small groups as one of the necessary components of healthy growth. Why is that? What’s so special about a small group? I’m part of one (more than one, really). My Sunday school class is my “small group.” I’ve noticed that I especially appreciate them in the summer. Summer is a time when everybody is usually gone for at least one or two Sundays – people who would normally be in church are missing – me included. It’s also a time when I in particular spend some time in other classes as a substitute teacher. From the beginning of June until the end of August, I’ll only get to my own class six times. Some of the times I will or have missed are by choice – I’m just not in church – or by service – I’m somewhere doing something else. I don’t begrudge any of them, but each summer it calls into sharp focus that I need my own class, nd I miss them when I’m not there. Why? It isn’t just that I like the people in the group (although I do). It isn’t just that we have fun (although we do). It’s not only fellowship I find there. My small group is my attachment to the body of the church. It’s the place where I know I’m not invisible (that sounds goofy, but it isn’t meant to be – I just can’t think of a better way to express it). From the end of high school through college and my “young adult” years, I was part of a few different classes, but never really put down roots. I was wandering. Floating. I finally, by default, ended up in my present class (which is, ironically enough, called Koinonia). It took a couple of years, but I finally stuck somewhere. I’m explaining all of this because as we look at ways to bring people into church, I think we need to remember that they won’t stay with us – they won’t grow – unless they get rooted somewhere. It by all means does not have to be Sunday school. There are lots of “rooting” spots in a church. It doesn’t have to be only one place – S and I both have more than one small group – it’s just that Koinonia is the one I’ve been in the longest. This job we have -- making disciples for Christ -- isn't done when they walk in the door; it's only just beginning. Just like they used to say on the TV show Cheers – we all need a place where “Everybody knows our name.” Koinonia knows my name. Oh, and a note -- It was pointed out to me that in the post about the two signs, I talked about the sign on the left, but I called it the sign on the right. I'm aware of this goof (now, since it was pointed out to me), but I'm not going to change it. Let it stand as evidence of who I am -- someone who just doens't "get" right and left. Up and down, north and south, here and there -- all concept I grasp. Right and left leaves me clueless. I have assigned my right/left correctness to my husband, who tries to keep me straight. I should have had him read the post before it went up. I have many heroes. One of them is my older (13 year old) son. He is many things that I am not -- coordinated, courageous, and outgoing. There is also great joy in seeing some of the parts of me that I think are the best reflected in my child. He isn't perfect (at all), but I am glad in him. He volunteered a few weeks ago to lead Children's church. This is the time in our service when the children from kindergarten through 3rd grade (or so) leave the service for their own time of "worship." S and I had the pleasure of watching him -- and the struggle of trying to not "help." He based his lesson on the story of Joshua and the Battle of Jericho. As he was teaching, he asked the kids if they felt safe at home -- they all nodded yes. He explained that that was what the wall of Jericho was like -- it was to make the people who lived there feel safe. He told them that God could tear down walls. What are the walls in our church that make us feel safe? What walls do we need to ask God to tear down? We have certain expectations, don't we? We place walls around the youth -- walls that define our limits of what role they should play in the church. They can stay up in the youth lounge, play games, go somewhere for pizza, but we don't really want them to lead worship or make a mess. 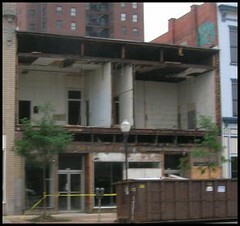 Thankfully, God has started blowing trumpets in our church and tearing down those walls. We place walls around our image of what men and women should do in the church. We have traditional services on Sunday morning and a not-so-traditional service on Thursday night. We build walls between the people who attend each one. We build walls that define what ministers should do in the church. Heaven forbid one of them steps outside those invisible barriers. We have certain expectations of how money should be spent -- and some of them are exactly right priorities, but some of them should have some walls removed. We wall in our idea of how people should look at church -- the clothes they should wear or not wear -- I do it myself to my own boys (and I'm not changing my mind). We wall out new technology and wall in our traditional music. We wall out the involvement of children and youth in the service and wall in our order of worship. We build walls so that we can feel safe, but God can tear them down. 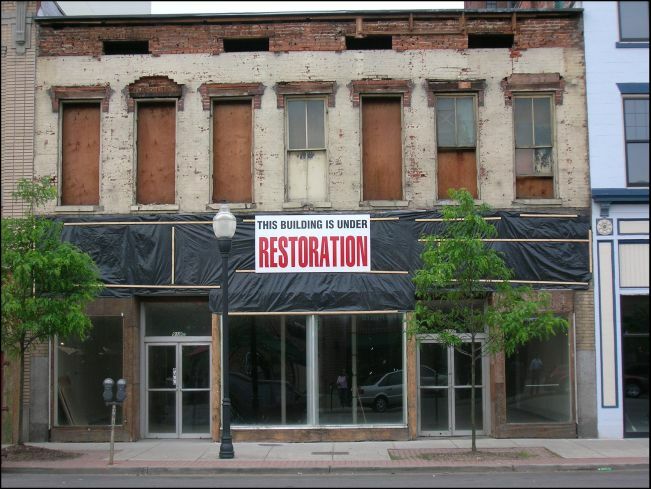 We can tear down those walls with God's help. You go, babe, and tear down those walls. Image: The picture is of a retaining wall at work. I was walking in from the parking lot, and said to myself, "Self, someday you're going to need a picture of a wall." So there it is. We went to Lexington today, and had dinner at Macaroni Grill. 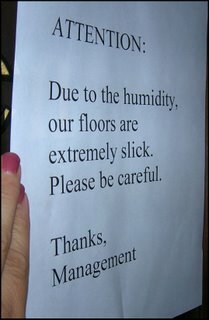 I've already posted (this morning), but these two signs tickled me. The one on the right was on the outside of the door to the ladies' restroom. After my experience of the past few days, I thought I was in trouble. 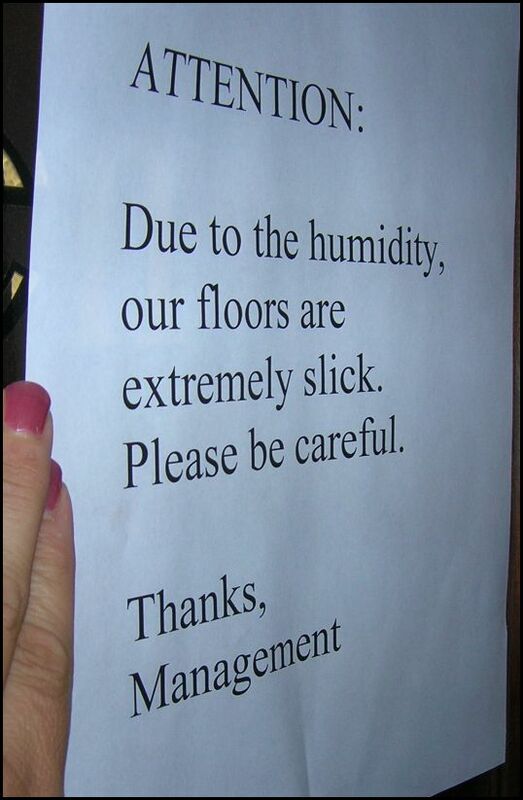 Luckily, the floors were not humid. The real problem was what I noticed on the way OUT of the restroom. 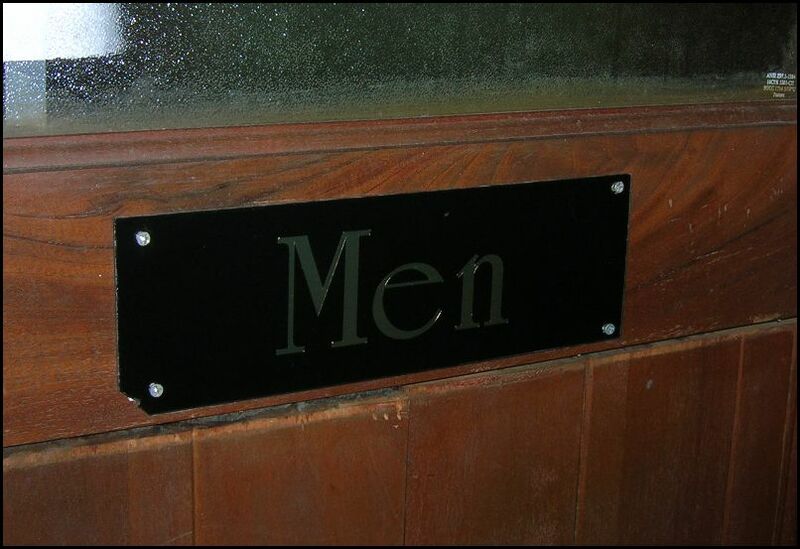 Turning around and seeing "Men" on the back of the door could have been more unbalancing than slick floors. I didn't fall, and, happily, I wasn't in the wrong room. 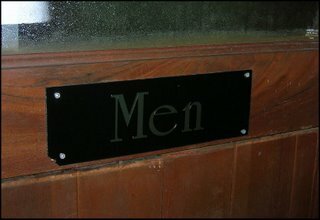 I also have it on the best authority, three times confirmed, that the men's room has the word "Women" on the inside of the door. What I don't understand is WHY. Of course, this really only provides confirmation of how weird I am. The look on my guys' faces when I came back from the restroom with my camera in my hand was "priceless." There is also a bartender in Lexington who, for just a few moments, was probably wondering why the crazy lady was taking pictures of the restroom door. Was she gathering evidence for her "slip, trip, fall" lawsuit? Did she have a strange door fetish? I need a t-shirt that says, "Ignore me; I'm just blogging." Dinner was great -- bowtie pasta and pesto. The waiter did a good job. Of course, he may have heard about the crazy lady from the bartender. I also wanted to take a moment to mention the comments on The Fall post. Gentlemen (including S, whose comments weren't posted but told in person), as the song goes, "You lift me up," which is certainly appreciated after a fall. Thank you. I'm reading another book by Philip Yancy -- The Bible Jesus Read. It's another pick from S's bookshelf. I didn't know he had so many interesting (to me) books over there. The big, noticeable ones are all about lighting and lighting design -- important to him, but not "must read" material for me. I just finished (a couple of days ago) the chapter about Job. I've mentioned before that as I read Job earlier this year, I was surprised the impression that it made on me. I expected it to be depressing and useless -- it can be depressing to be sure, but not useless. There's a neat trick in Blogger (and this will work on almost any Blogger blog) -- in the top bar that I never pay attention to, there is a search window. You (I) can use that window to search for any term that has been used on this blog in particular or in any Blogger blog all together. When I searched for Job on this blog, I got 31 hits. Not surprisingly, most of those are hits to the word job (rhymes with Bob), but 7 of them are hits to the book of Job. I'm surprised that I've mentioned it that often. Anyway, if I think about Job, I can divide it into three parts -- the first two chapter where God and Satan are talking, the middle, where all the bad things happen to Job, and his "friends" come to "help" him, and the end, where Job and God have a conversation. I came away early this year really impressed with the third section, but still a little upset with the first two chapters. It always seemed to me that in this book of the Bible, God and Satan were playing a game with Job as the chess pawn. I didn't like it; it didn't fit with my "big picture" view of God. I don't want to be a chess piece; I want to be a child of God. We often think that the book of Job is about suffering. It is, I suppose, in some ways -- it can't help but be, with all the suffering Job goes through. But after reading Yancy's thoughts, I am more convinced that it is a book about faith -- Job's faith in God, and God's faith in Job. When we look at Job to answer the question, "Why do we suffer," we probably won't find answers. God wants our love not because of what He can (and does) do for us -- not for what we can get out of the relationship with God, but only because He is God. Do we have faith in God solely because of what we can get out of it? And doesn't the idea that God wants our love only because of who He is resonate with us? Isn't that why we want to be loved, too? Not love in reaction to what we have, or what we do, or how we look, but love because of who we are. In the book Extraordinary Faith by Sheila Walsh (I found that link by using that search window -- isn't it neat? ), the author describes an extraordinary faith -- God's faith in us. God chooses Job for this "test" because He has faith in Job -- of all the people He could have picked, he picked Job. Job wasn't a chess pawn; he was an honored participant in a very important enterprise. The outcome of the "test" mattered; it wasn't a game. Would Job have enough faith in God to continue to believe in Him even when everything is taken from him? Would Job have enough faith to love God even when he believes that God has taken everything away from him? Would he love God for who He is, rather that what He gives? "One man's faith made a difference -- it isn't explained, but it is suggested." The outcome of the "test" -- the test of one man's faith -- mattered to God. I like the comparison he makes between the story of Adam and Eve in Genesis and Job. Adam and Eve live in paradise. They have direct communication with God -- He walks with them. Their circumstances are perfect. They only have one task -- don't eat the fruit of that particular tree standing right over there. There is no guesswork, and, if you think about it, not much faith involved. They are told directly, in a perfect situation, with a pointing finger -- don't eat that! And they fail. Job on the other hand, is in the least perfect situation -- it's horrible! He doesn't have direct communication with God (until the end), and he doesn't really have any idea what he is supposed to do, or why any of this is happening to him. God had already seen what his creation would do in a perfect situation; it's a wonder that He could have faith in Job at all in this very far from perfect situation, and yet He does -- see why it's extraordinary faith? As the story progresses, of all the questions, requests, and demands that Job makes, the only one that God grants is Job's right to question God. Isn't there a message for us in that? The book of Job is not about suffering; it is about a crisis of faith. We need faith at the precise moment when it seems the most unreachable. Through it all, though, God is there. Yancy said, "God cares more about our faith than our pleasure." That's a tough one to swallow, isn't it? I like the foreshadowing that is in the book of Job. Job cries out for an advocate -- someone to stand between himself and God. Doesn't that sound like a cry for a savior? And don't WE have that advocate? Secondly, in the end, all that Job lost was returned to him doubled -- his animals, etc -- except for his children. He does later have more children -- exactly the same number as before, but the number is not doubled. Yancy says that this is foreshadowing of the idea that Job hasn't really lost the first group of offspring -- he'll be reunited with them in heaven. I always really cringed at the idea that God punishes us for our bad behavior by making bad things happen to us. That idea doesn't fit in with my "big picture" of God. This book of the Bible flies in the face of that kind of reasoning. What happens to Job doesn't happen as punishment for wrong doing, as his friends want to point out. It happened because God believed in him. Notice very carefully, also, that what does happen to Job isn't done by God; it's carried out by Satan. God agrees to it, but not as some kind of game between two "good ole boys." He allows it because He has a huge amount of faith in Job's love for Him, and He never leaves Job alone in this crisis. In the end, God leaves no room to doubt that He is GOD, but doesn't that revelation of Himself make the audience He grants to Job even more extraordinary? God is God, but he takes the time to show His face to Job. So, it may not be my favorite book of the Bible, but it's climbing up the ladder. Image: A picture I took of the sky sometime in January. That's all I know; I found it on my hardrive this morning. I tried to get a photo of the rain last night, but nothing worked out. Is there a lesson in that? Job isn't about the rain. It's about looking up. Joke: If you've made it ALL the way through this very long post about Job, you deserve a joke, so click here. On the way into work yesterday after lunch, I slipped and fell on a slick rug outside our door. Who puts a rug outside a hospital door in the rain? It’s always there, but yesterday afternoon it was as – if you’ll pardon the nasty expression – slick as snot. My foot slipped out from under me and I landed right on the side of my knee. The knee is a wonderful piece of machinery. It’s elegant in its construction, but it is not really designed to absorb the impact of a fall. That’s what backsides are for (which is what I landed on next). There was no real damage done (except to my slacks – very dirty rug). I have a small knot on the side of my elegantly constructed knee which only hurts when I push on it (yes, I know, don’t push on it). Don’t get too impatient. I’m telling you that story for a reason, which will soon be revealed. This morning I listened to a sermon on the way into work by a minister who attends our church. When our two ministers are attending the WV Annual Conference, David often preaches. He’s from Georgia, and isn’t a member of the conference here. I missed his sermon this year because we were on vacation. Listening to it on CD has been on my “list” of things to do, so I did that this morning. He started off with a litany of the people and things we hate. The list was long – liberals, conservatives, fundamentalists, homosexuals, immigrants, Yankees, that high school over there, youth worship, praise worship – I really don’t think anyone was excluded from this “I hate … “ list. It was, of course, an illustration of how ridiculous we are, and how stereotypical our viewpoints can be. It was a sermon about how we pay “lip service” to being a Christian, while ignoring what it is to really BE a Christian (my words, not David’s, and I’m sure I’m murdering his sermon by summing it up). I was feeling pretty good. I mean, it was a warning to be careful not to hate – not to judge people or to say we are Christians while ignoring the command to love our neighbor as ourselves. Really, though, I already try to be careful about that. I caught myself hoping that so-and-so in the congregation was listening, because he/she really needed to hear what David was saying. I would have been happy if he had stopped there, but he didn’t. What does the Lord require of us – “to act justly and to love mercy and to walk humbly with your God.” (Micah 6:8). David then went on to list all the things he does in the church – and the list was long. Really long. His point was that all of that – all that he does in the church – is not what is required of us. Do I act justly? Do I love mercy? Do I walk humbly with my God? Walk humbly? It came to me this morning that my walk is anything but humble. I think God used David this morning to tell me that my problem isn’t hate, it’s pride. My husband just called and asked if I fell again this morning. I almost answered yes. I did fall this morning. I slipped on the word of God and landed on one of my most elegantly designed sins – my pride. And it hurt. It hurt the most, I think, because as I feel that I am getting closer to God, He took an opportunity to tell me what I was doing wrong. If David hadn’t mentioned those Lenten Prayer crosses, it might not have gotten so personal. I’ll sing your song for you. Then I’ll sing it for you. Because I am bound to get in His way. Because that’s the reason for the song. A warm place to sleep. Freedom from the fear of hunger. If you will listen past me for His love. A listening ear and a silent tune. If you promise to listen past me for His love. Sometimes that song isn’t pleasant. If you'll try to listen past me for His love. Songs sung that I don’t like. Prayers that I don’t understand. A tune that means nothing to me. It’s your song; not mine. If it will bring you closer to God. When I will need to hear God. You can sing my song for me. That’s how we love each other. I'm teaching this Sunday, and believe it or not, I've started reading the lesson. I'm a notorious procrastinator, but I have actually read the student book. I don't know who is teaching my own class (I'm teaching a different class than my own), but I hope it's Mike. This thing is full of sports metaphors -- right up his alley. Not right up my alley, although I have been to many track meets in the past year or so; a couple of illustrations do come to mind. One in particular is about our son, G, who broke his hand running track last year. S wrote about it in his Advent devotional, and you can read it here. The point that plays into this lesson is that after G (unknowingly) broke his hand, he got up and finished the race. My hero. This year at track I was watching a young 6th grader run a distance race. He was not doing well -- actually, he never did well. In this particular race, he was running "neck and neck" for last. He was about 10 feet from the finish line (in a mile race), and he turned around, saw that the last place runner had found a last bit of speed, and was gaining on him. Rather than speed up, the young man slowed down in disappointment, and came in last. Run the race in a way that you may win it. Think about athletes. I don't know much about athletes, but I can make a few assumptions. First, they train. They practice. They exercise self-discipline. How can we do that as Christians? Study. Read. Pray. Serve. Just like the way to loose weight always boils down to watching what we eat and exercise -- what we really want is a magic pill -- spiritual discipline boils down to hard work. Unlike school, we never reach an age of graduation or completion. We have to keep running the race. We never get to stop serving or stop studying or stop praying or stop loving others. So why does an athlete train? To do a better job running the race. To get closer to the goal (which in sports is usually winning the event). What happens when we practice our own spiritual disciplines? We getter closer to our goal. We get closer to God. We learn more about him. We experience his presence on a more frequent basis. We grow in the faith. Right? If that is the case, then when the race gets more challenging, when it rains or when the track is muddy and slick (believe me, I've seen that), the athlete is more capable of competing if he is well trained. Look at verse 13: No temptation has seized you except what is common to man. And God is faithful; he will not let you be tempted beyond what you can bear. But when you are tempted, he will also provide a way out so that you can stand up under it. I like that. I like that God has provided us with a way to stand up under the tough times. He doesn't leave us alone to handle them ourselves. I have to think, though, that having done the work ahead of time -- the training -- the study, the prayer, the service -- that we are more capable of receiving the help from God. If the training, if the practice, if the self-discipline brings us closer to God, then we are -- well -- closer to God, and better able to receive the fruit of His promises. Am I wrong? Is it too simplistic? The class I am teaching is an older one, and what I WANT to say is that the race isn't over -- service and self-discipline don't end with older age. The truth is, though, that we ALL need to live our lives as if the end of the race is tomorrow or even tonight. What can I do TODAY to serve God, because I may not have tomorrow. Will I hear Him say the words “well done”? I probably ought to find a teacher's manual tomorrow while I'm at church so that I'll KNOW what I should talk about, rather than not. 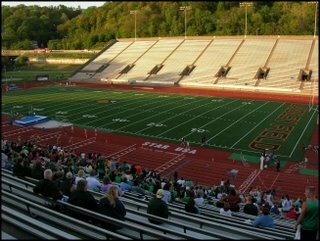 Image: Laidley Field in Charleston during a track meet last spring. Have I used this photo before? J and I climbed to the very tip top of the bleachers to take this one. The trip down was quite exciting as I tried to avoid it becoming fall rather than spring. Everybody needs a plan and a goal. We were sitting at dinner tonight, watching three men in the lot next door do -- well -- something to this car. I don't know what the plan was, but I'm hoping it wasn't to change the spark plugs. Notice that the man is in the trunk, not under the hood. I had a goal and a plan at the beginning of the year to read the Bible -- straight through. I explained the goal on this blog and then kept track of my progress in the sidebar. This "public" declaration and measurement was only for me -- to keep me accountable to what I had said that I would do. I felt a little strange doing it -- the blog part, I mean, because I didn't want it to seem like a "Look what I'm doing" kind of display. I hope it wasn't seen as that, but in the end, it did what it was supposed to do. It kept me on schedule, and I finished what I set out to do. So now it's time to set a new goal and design a new plan. I'm going to blurt it out here on the blog for the same reason as the previous blurting -- to keep myself accountable. So, really, this post is for me, and you can read it if you want. My goal: Continue reading each morning. I've enjoyed this early time that I have set aside to focus on God. It has been a nice start to my day. This time, I want to invest some effort in the Revised Common Lectionary Readings. Read part of the Revised Common Lectionary Reading for the week on each weekday, Monday through Thursday (Monday = Old Testament, Tuesday = Psalm, Wednesday = Epistle, Thursday = Gospel). In a journal, record the ID of the reading, and a very short sentence or two of impression. In the journal, record a sentence or two of impressions from the devotion. Spend some time in prayer at the end, including a short sentence prayer written in the journal inspired by the readings. So far I've done this for two days, and I like it. I thought I would use The Message version of the Bible for a more modern twist, but Psalms in The Message are just icky. Bad translation for the poetry of those writings. To compensate for that problem, I've added an NRSV bible to my stack of books. What I would really like to find is an NRSV / Message parallel Bible, but I don't think one exists. I have noticed so far that the writing each day is helping me to focus (read -- keeping me awake). By the time I get to the prayer at the end, my prayer seems much more awake and in contact with God (read -- I'm remembering to pray for what is on my mind, and am able to listen a little better without -- you guessed it -- falling asleep). I'll try this for a while. So far, so good. Everything that you can hear, or taste, or smell. Even those things beyond your senses. All of it belongs to the Lord. That is called the Presence of God? Maybe we should start with ourselves. Wash our hands of sin. Clarify our hearts to make them pure. Await all who seek the face of God. A face that can be known to us. What is left for us to do? And feel the light of God on our skin. To be blinded by the glare of his presence. To us He is the definition of strong. Sometimes too high for our short reach. Lorna of See-through faith found something she had written a few years ago. Go here and read it. God's love is like a waterfall. It particularly blessed my morning.